Courtyard by Marriott Times Square West welcomes fans to celebrate the 100th anniversary of the Copa America at MetLife Stadium this June. Copa America will feature teams from the South American soccer federation, as well as, six North American teams at ten venues throughout the United States. Copa America is generally agreed to have the highest level of play in international soccer, outside of the World Cup and the European Championship. The full schedule of games to be held at MetLife Stadium include: Ecuador vs. Haiti, Quarterfinal and Final games. Along with fantastic games, fans can participate in a “FanHQ” event at Terminal 5, where attendees can eat and drink, hear live music and hang out with other soccer fans. Courtyard by Marriott Times Square West welcomes soccer fans to stay the night in the city after these big games. 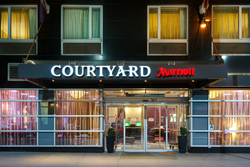 Courtyard by Marriott Times Square West is just 7.5 miles from MetLife Stadium, with plenty of public transit options available to guests and fans. New Jersey Transit, Path Train and New Jersey Transit bus service are all within a five minute walk to MetLife Stadium. For more information, please visit http://www.nycgo.com/articles/copa-america-soccer-2016. Courtyard by Marriott Times Square West has 224 contemporary, chic hotel rooms, perfect for soccer fans, business and leisure guests in New York City. Each guestroom features free high-speed Internet, a mini refrigerator, an in-room safe, flat-screen HDTV and much more. On-site dining at the Bistro offers guests a casual environment with high quality, healthy menu options for breakfast and light evening fare to enjoy with a cocktail from the bar at daily happy hour. With a seasonal menu, the Bistro offers ever-changing options mixed in with old favorites, perfect for guests looking to expand their palate. Transportation is convenient with Penn Station, 34th Street- Hudson Yard Station, Amtrak and Port Authority Bus Terminal all within a quick five-minute walk from the hotel, making it ideal for all travelers and travel enthusiasts to get around New York City, year-round.